NOTES: Multi-media kit in Resin and metal with vacuform clear bits. Calls for more power over the 206 GT were answered with the 2.4 L Dino 246. The engine was a 2418 cc 65-degree, dual-overhead-camshaft, 9.0:1 compression ratio, iron block with alloy heads. The European motor produced 195 bhp (at 7,600 rpm), and was available as a fixed-top GT coupé or, after 1971, an open Spyder GTS. The American version had an exhaust air-pump, and timing changes which created 175 hp (130 kW). The GT had 3 Weber 40 DCNF/6 or 40 DCNF/7 carburetors. For the 246 a new version of the Dinoplex ignition was deployed, the more compact Magneti Marelli AEC103A system. Dino 246 production numbered 2,295 GTs and 1,274 Spyders, the latter being built from 1972 to 1974 only, for a total production run of 3,569. 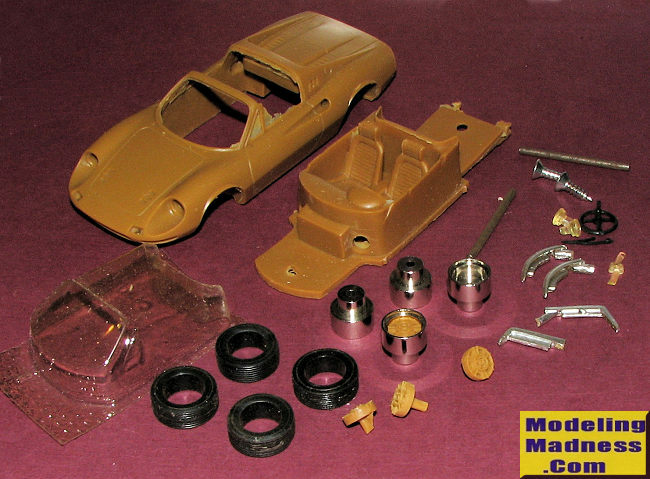 Typical of the genere at the time this kit was produced, the parts count is not high and there are no photo etch bits. The main resin pieces are an upper body with a lower pan that includes the interior. There is flash over several of the window openings and some small stubs on the underside to remove. The only part to go into the interior is a steering wheel. There is a hole drilled for a gear shift lever, but none was included with the kit. This will be easy enough to duplicate with a section of straight pin. Chromed metal bumpers are included. One of my rear bumpers is shorter on one side than the other so I'll have to do some trimming during assembly. Headlights and turn signals are resin castings. Four spun aluminum wheels are provided with resin inserts for the standard wheels without knock-offs. A vacuformed piece is provided for the clear bits. Since this is a targa, the front and rear sections will need to be cut away prior to installation. Note that the rear window is curved on the outer edges. Two metal axles are provided along with rubber tires. Each of the wheel assemblies will be trapped between the upper body and lower chassis/interior pan. A pair of screws will hold the car together and there is a plastic windscreen wiper included. The kit provides no instructions and frankly, none are needed. There are enough images of the car and its various color permutations available on the 'net to supply the painting info that is needed. About all one could really ask is for some license plate decals, but again, those can be found with a bit of sleuthing. Would this make a nice kit for someone just starting into multi-media kits? Yes it would. There are enough parts of different materials to allow one to get involved in the genre without going over their head. The quality of the parts is very good, and better yet, the resulting model will not overwhelm one's display area. I've been bulding 1/43 car kits off and on for many years and have no trouble recommending these. While the companies for many of these early kits have gone out of business, the kits are not difficult to find, and for the most part, are not expensive.